This strikingly sleek modern design is full of intricate details. The result is something that appears at first to be quite simple and classic, but actually contains a subtle richness that is the result of a very complex production process that requires a high level of precision, skill and experience. Kanok created this using the latest production techniques and modern machinery, pre-assembling precision crafted materials in our factory so they can be easily installed at the construction site. The result is a stunning finish with a consistently high level of quality. 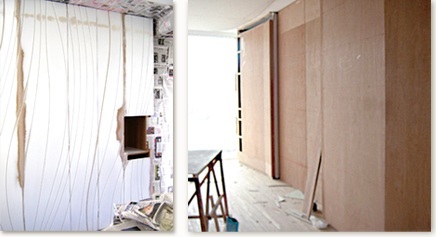 The intricately patterned curved wall design requires years of experience and know how to produce, beginning with organizing key details and constructing precise mock ups before actual construction. Such work requires the use of extremely precise machinery in order to properly calculate and cut out the model patterns. In order to paint the wall, a special computer controlled Spray paint equipment is needed in order to control the thickness and ensure uniformity, and finishing with a infrared light coating. Almost every component of the wall is constructed at our factory before delivery to the construction site. 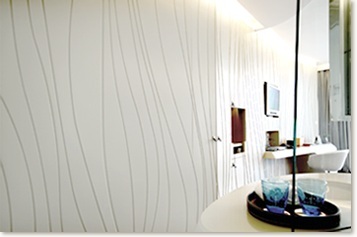 Walls decorated with curved line patterns add modern style cues to simple rooms. Their production, though, is not so simple, requiring attention to detail and many stages of production. Precision is the key in such construction, starting from a creating an exact model, proper scaling of elements, and the final machine production to exacting specifications. The patterns in each wall section join up seamlessly before a final coating with paint.